Hans von der Hofen, founder of Abbatare Inc., the only broker for German Alpha Jets in the United States, has more than four decades in aviation. For more than 40 years, Hans von der Hofen has developed two successful and very different careers. In fact, it’s difficult to know whether to call him a land developer who loves to fly planes or a pilot who loves to develop land. But it’s his aviation experiences that capture people’s attention, from learning to fly floatplanes on Lake Union in Seattle as a youth to operating a western states’ airline, starting a flying school and importing surplus European Aero L-29 and L-39 aircraft and Alpha Jets into the United States. Today, it’s his marketing of the Dornier Alpha Jet, a twin-engine German jet strike aircraft, which has generated publicity for him. Arlington, Wash.-based Abbatare Inc. is the first company to import German Alpha Jets into the U.S. Hans isn’t the only von der Hofen involved in the business. His son, Stephen, 37, who is training to become a pilot, serves as vice president. Von der Hofen recently sold one of the high-performance aircraft to General Motors Vice Chairman Bob Lutz and another to Microsoft cofounder Paul Allen. 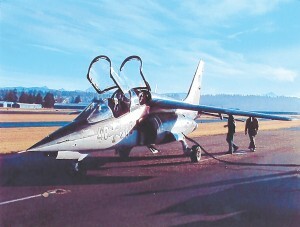 After Allen bought one of the Alpha Jets, the fast, high-altitude aircraft was used as a chase plane during the successful Allen-financed SpaceShipOne flight that won Scaled Composites and Burt Rutan the $10 million Ansari X Prize. With over 2,650 civilian pilot-in-command hours and a commercial ATP, von der Hofen says he basically started out to buy himself an airplane, and happened to get into brokering L-29s and L-39s in the United States. “It was a hobby that’s grown,” he said. The L-29 is a two-seater basic and advanced jet trainer manufactured by Aero Vodochody of the Czech Republic. T he L-39, is a single-engine, two-seater, subsonic aircraft with the primary mission of basic and advanced training, as well as light attack missions. After marketing a number of L-29 and L-39 aircraft left over from the Cold War-era air forces of Eastern European governments, von der Hofen discovered an opportunity to import retired German Alpha Jets to America. Built in the late 1970s and early 1980s by the Dassault-Dornier Franco-German consortium, Alpha Jets were priced at the factory at about $7 million each (U.S. dollars). The jets are subsonic military aircraft with a speed of around Mach 0.86, a service ceiling of 48,000 feet and a range of 1,500 nautical miles. 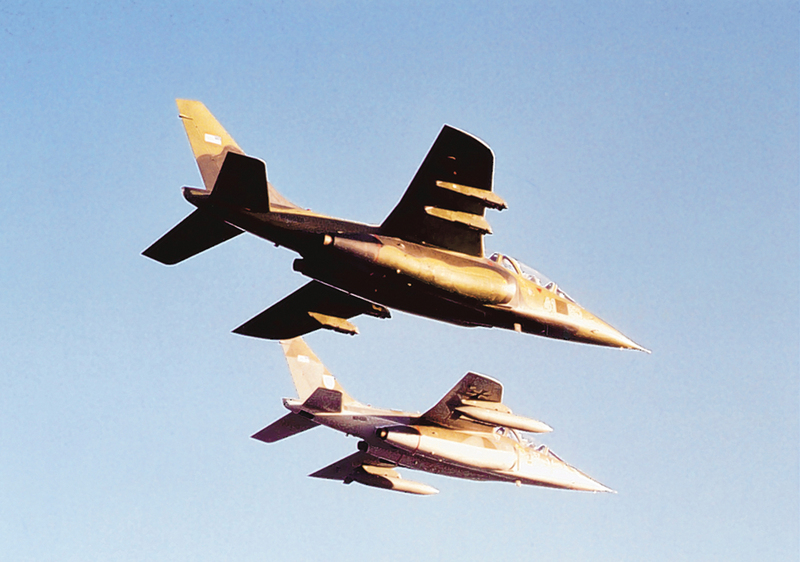 Equipped with SNECMA-Turbomeca Larzac turbofan engines, the plane originally served with the air forces of Germany, France, Egypt, Cameroon, Belgium, Ivory Coast, Morocco, Nigeria, Portugal, Qatar, Thailand, Togo and the United Kingdom. Avionics for the German aircraft included a Lear-Siegler inertial navigation system, Litton Doppler navigation radar and a Kaiser/VDO head-up display, while the French trainer version has only basic avionics, giving the French Alpha Jets a distinctive rounded nose compared to the fighter version’s pointed shape. Alpha Jets’ maintenance work is reviewed by Hans von der Hofen (in cockpit) and Mike Lee, whose Arlington Jet Services at Arlington Airport provides national maintenance on L-29, L-39 and Alpha Jet warbirds. Many of the small, fast, high-wing planes still fly in several countries today, but the Luftwaffe began phasing the fighter-bomber out in 1992, keeping 45 for fighter pilot training and passing on 50 to Portugal. The last one left German service in 1998. Several of the French Alpha Jets have flown with that country’s Patrouille de France aerobatic team since 1979. As German planes were retired, three of them went to Austria’s demonstration flying team, the Red Bulls. He said there’s a very small market for the jet. “It’s a powerful fighter aircraft and not everyone can fly them,” he explained. He says that’s where his flight academy, Alpha Jets USA, comes in. “We train pilots to handle all of these planes or to improve their performance with warbirds they already fly,” he said. Flight instruction is provided by von der Hofen and Rick Millson, chief pilot for Abbatare Inc. Millson has accumulated over 15,000 hours in a career that’s spanned over 40 years, and includes two tours in Vietnam (250 combat missions and over 400 carrier landings), a tour with the U.S. Navy Blue Angels, and 25 years in the corporate and flight test arena. Those credentials go a long way in building confidence in the flight training program. During the production of a special air show video on the Blue Angels, Millson worked with Seattle photographer Paul Marlow. Today, Marlow is the prime photographer for fulfilling the photo and video needs of von der Hofen’s company. 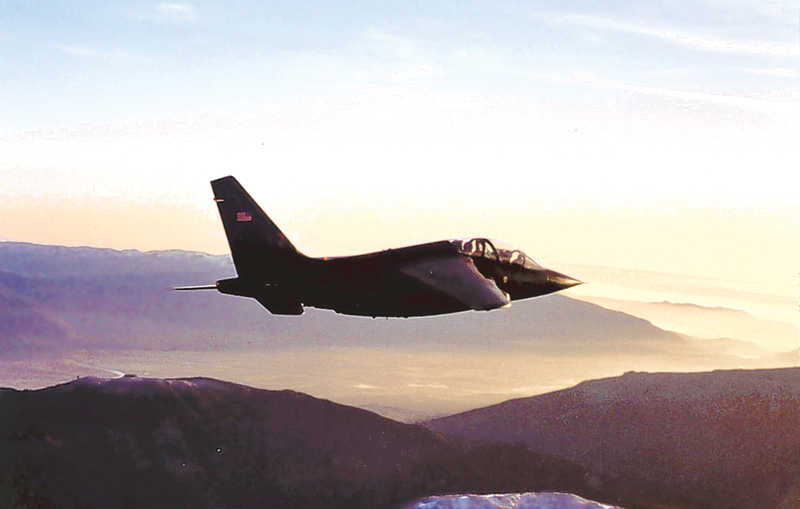 Marlow’s photos and videos of Alpha Jet flights over the Cascade Mountains are now a favorite feature on von der Hofen’s website. One student was a French airline pilot who had seen Alpha Jets fly and wanted to learn how to fly one himself. “He said he couldn’t do loops and rolls with the Airbus 319 he flew because having 300 people sitting behind you really limits the aerobatics you’re allowed to do,” von der Hofen said, grinning. The flight school appealed to von der Hofen because there are more than 5,600 warbirds in the country, but many of the pilots flying them don’t have the experience they need to handle them fully or safely, he said. He hopes Alpha Jets USA will help remedy that problem. A pair of Alpha Jets flies formation on a training mission. He said they’ve trained 41 pilots since February 2004. Today, von der Hofen’s involvement in aviation has expanded greatly over the days when he would seek out some flying time amidst the pressures of large subdivision land development. Abbatare is the managing body of Arlington Air Park, a group of commercial hangars von der Hofen built on the west side of Arlington Airport. Those hangars come in several sizes. Arlington Airpark offers a wide variety of services including jet training, sales, aircraft maintenance, aircraft restoration and aerial photography. One of the newest arrivals at the airport is Paul Allen’s Flying Heritage Collection, housed in two of von der Hofen’s airpark hangars. The collection showcases meticulously restored World War I and World War II fighter planes, including a P-40, P-51 and a British Spitfire. Among the tenants in von der Hofen’s hangars are tool shops that serve the nearby Boeing Co. airliner assembly plant in Everett. Morgan Aircraft Restoration modifies and restores warbirds and other aircraft, with compete sheet metal and structural repairs, custom paint services and the installation of customized executive interiors in a variety of aircraft. Von der Hofen has also formed a close alliance with Mike Lee’s Arlington Jet Services LLC, a maintenance facility for the European military jets as well as other types of aircraft. 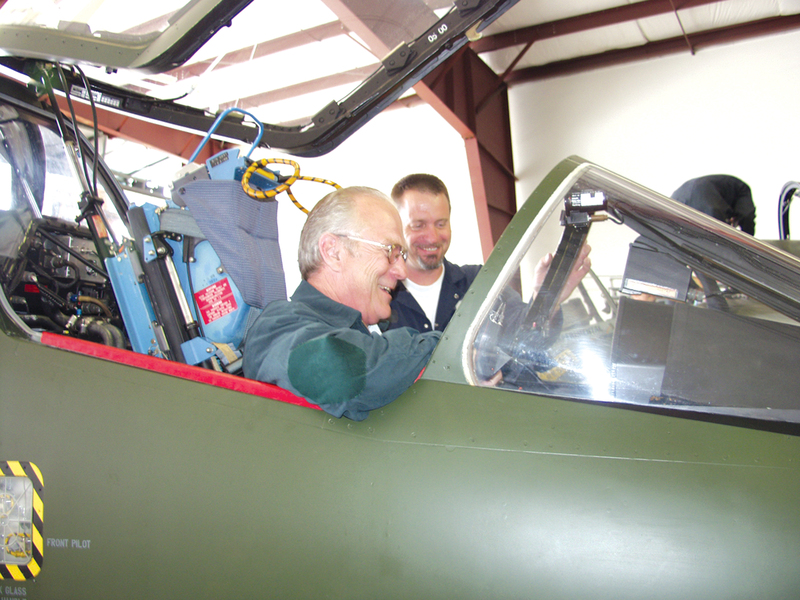 Lee’s business currently maintains 11 of the 12 Alpha Jets in the country, as well as five Czech L-39s and two L-29s, Huey helicopters and aircraft with turboprop and reciprocating engines. 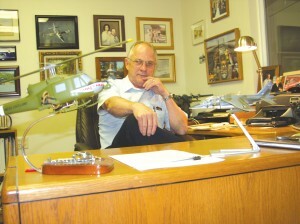 “I spent nearly two decades working at Boeing on every model from the 737 and 747 to the 757, 767 and 777. Now I’m also proficient in maintaining a number of different warbirds,” Lee said, standing in a crowded hangar with three Alpha Jets in various stages of engine work, fuselage repair and painting. He’s been so successful with the airpark that von der Hofen is starting a major expansion this summer, which will double the number of hangars at the site, preparing for the area’s rapid economic growth. The completed business park will cover 15 acres, including hangars, offices and ramp areas. “The airport is adding jet activity to an airfield that used to be primarily private prop planes with a couple of corporate jets,” he said. He noted that there are about 20 jets operating there, including his L-29s, L-39s, Alpha Jets, a Falcon 500 and a couple of Learjets. Abbatare Inc. provides flight training and maintenance services for military jets such as this Alpha Jet. Although Arlington Airpark is a real estate development, what he’s used the airpark for has definitely entrenched him even more deeply in the world of aviation. Originally moving north from Seattle three years ago to develop the airpark’s complex of large commercial hangars, von der Hofen now has his residence near the airfield, enjoying the freedom of a short commute without countless hours spent in freeway gridlock and travel time. He also enjoys the more relaxed lifestyle of rural living, views of the nearby Cascade Mountains, and open space for his high-performance aircraft. Looking back, von der Hofen acknowledges he’s come a long way from his military service with a U.S. Marine Corps tank unit, a decidedly on-the-ground assignment. Yet he’s made up for much of his missed flying opportunities with the Marines by taking on a wide variety of other aviation ventures during his life. In an upstairs hangar office decorated with pictures of family and aircraft, plus models of planes that include the Alpha Jet on his desk, von der Hofen reflected on his sporadic aviation career that grew into a lifetime of loving to fly and flying the planes he loved. For several years, he flew a Vickers Viscount 7450 as part of a small 125 certificated airline, Redmond Air International, flying unscheduled passenger flights and chartered air services for tourists to casino destinations such as Reno, Las Vegas, Carson City and Elko, Nev. Later, his airline venture ended by the deregulation of airlines and tough new competition, von der Hofen tried a couple of ultralights, before climbing into the cockpit of a Beechcraft B-88, of which only 47 were built, and a French Broussard, similar to the de Havilland Beaver bush plane. These days, von der Hofen isn’t just in to speed. A “B” model Bell UH-1 Iroquois “Huey” rests in the hangar beneath his office. He’s taken the Vietnam-era workhorse on as his next challenge, and he’s loving every minute of it. He also has plans for what he might take to the sky in next, his 1950s-vintage MiG-15 now in the hangar a few feet from the Huey. “What was a greater aviation symbol of the Korean War at that time than the F-86 and the MiG-15? It really would be fun to fly it,” von der Hofen said, with an anticipatory tone in his voice. For more information, visit [http://www.alphajetsusa.com] or call 360-474-1993.